Siem Reap may be small compared to nearby travel hotspots such as Bangkok and Phnom Penh, but the gay scene here is very well formed. A Buddhist country, Cambodia is generally pretty tolerant of homosexuality, though there remains heavy pressure on young men and women to follow the traditional path and settle down, marry and have children. Thus, while visitors can expect a genuinely open-minded welcome, it is still more difficult for gay Cambodians to step out of the closet. Big smiles all around at Miss Wong's. This is so even though homosexuality has received the royal seal of approval. In an interview with the New York Times, a spokesman for the royal family said, “We’ve always been very tolerant about sexual preferences as some Khmer Royals are/were openly gays/lesbians”. While there are still no venues that cater specifically to lesbians, gay men can choose from a number of guesthouses that were created especially for them. The newest, and perhaps the most flamboyant, is Men’s, a hi-design boutique resort and spa that is 100% gay. As the name suggests, only men are allowed into the hotel, or use of the facilities including an 18-metre outdoor pool, gym, sauna and massage parlour. Longer established is the Golden Banana. Originally a small guesthouse that opened in 2004, the business has grown and now includes a boutique hotel and boutique resort, both of which have gorgeous garden pools and are located a very short walk away from town. 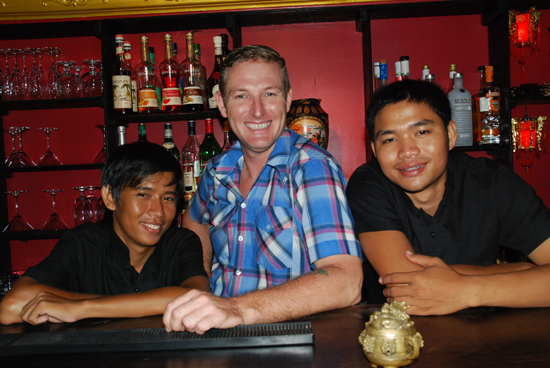 In town, the Linga Bar was the first gay bar to open in Siem Reap, has a fabulous reputation for its cocktails, and is also a great place to people watch. Linga recently celebrated its sixth birthday with a sparkling display from Linga Bar’s stars, the performers from the Saturday night drag show that owner Martin Dishman is convinced is one of the best in Southeast Asia. The crowds that stop to admire the powerful strutting, preening and dancing queens seem to think so too. More gay-friendly than gay-oriented, Miss Wong is a small bar that opened three years ago and is fast developing iconic status on the Siem Reap social scene. A night out that involves Miss Wong is just not like a night out anywhere else. The lush, red-walled décor creates a warm but classy atmosphere that is boosted by the friendly welcome and easy chat from Kiwi owner Dean Williams and his behind the bar team. The cocktails are special, and have a strong Asian focus using ingredients such as ginger, lemongrass and chillies. Other venues include Hotel Be, a super-stylish hotel, in the middle of town, opposite Linga Bar, and the Linga Spa, which offers a service entirely dedicted to the male body. Lolei Travel Cambodia is a tour operator that knows the gay scene in Siem Reap and can tailor your holidays accordingly. Phum Wat Damnak, Siem Reap.